Considering that San Antonio is developing something of a reputation as a party town (it’s also one of the country’s family friendliest spots, but there are plenty of ways for grown-ups to play! ), it’s only logical that the city should have just as many ways to tame the hair of the dog after a long night out. After one particularly late evening (or, um, super early morning?) spent hanging out with new local friends, Jen, Courtney, Amanda and I found ourselves reaching for our stock-standard hangover helpers– coffee, Advil, Diet Cokes and peanut M&Ms–but even that traditionally killer combo did little to get us on the road to recovery. Fortunately, our hosts Michael and Ashley took pity on their ill-prepared guests (four women who clearly hadn’t imagined that “Fiesta” would literally be one non-stop celebration) and decided to let us in on three of the city’s best post-party cure-alls. We’d stayed so out late after the River Parade on Tuesday night, that we could barely make it up on time for for our early morning tour of San Antonio’s most legendary sites. Michael and Ashley gave us the inspiration to keep moving but telling us we’d be hitting up Mi Tierra for lunch–that’s where we’d be able to recharge with some of the best Mexican-style comfort food in the city. Once inside the enormous and outrageously decorated restaurant and bakery, we filled up on plates of enchiladas, rich chicken mole, burritos and my favorite, chicken tortilla soup del mercado. 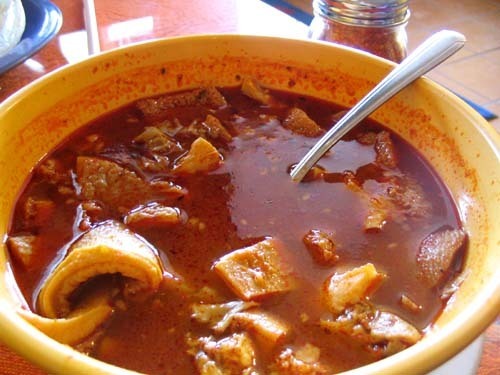 While the cheesy, hearty fare seriously helped line our tummies and replenish our energy, we learned that one particular soup on the menu, menudo, a spicy stew made from simmered tripe–yep, the cow’s stomach lining–and Mexican chiles, is known locally as the best hangover cure around. We’re not exactly sure how it works (maybe the, er, spongy strips of white meat take over the alcohol filtering when your own stomach gives out? Yikes!) but we’ll probably stick with the chicken tortilla soup! Over lunch, we started swapping stories of other ways to ward off the after-effects of alcohol. One of our new friends suggested that there simplest way to counteract this effect was with B-12, which is found almost exclusively in meat, seafood, eggs, cheese and other animal products. Since a deficiency in this vitamin can intensify the effects of a hangover, causing you to feel groggy and out of sorts (um, check! ), loading up on meaty dishes like chili con carne, carne asada and an incredible variety of tacos beforehand will help you stave off that can’t-get-out-of-bed-all-day feeling. 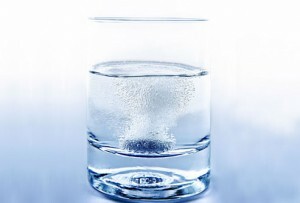 And if you’ve already done the damage, popping a B12 tablet (and perhaps an alka selter while you’re at it) can do wonders to help you recover. “Oh, you know what some people do?” said Michele, as we were making our way toward Papa Jim’s Botanica, a warehouse of all things spiritual, including charms to draw luck and love toward you. “They swear by these funky potions.” We headed to the voodoo “pharmacy” on the outskirts of town where we found ourselves faced with shelves upon shelves of candles, holy waters, amulets and saint statues (is there a patron saint of partying?). While there was a special “detox” section the store, I tried to find one particular brew that I was willing to take a chance on. In the end, decided that some unknown combo of herbs, essences and oils wasn’t exactly what I needed to do my body good—but a nap was. And so, as our crew rode back to The Watermark Hotel–a full day of sight-seeing, eating, TV appearances and shopping behind us–and I looked forward to my afternoon siesta. After all, beef tacos and B12 and funky potions are just fine, but nothing beats a few aspirins, a glass of water and serious dose…of sleep. I’m new to your site, so excuse me if this is something you have long been doing but… surely this is a set of handy tips that is needed for every city. The best places to get over a hangover is exactly what a traveller needs to know to be fully prepared for their trip! What a great idea Tom! We will definitely get on this–we can at least put together the top hangover cures in cities across the US. Any nominations from your own? Excellent blog! I essentially be devoted to how it is stress-free by my eyes so glowing for instance the tidings are anyway written. I am wondering how I be able to subsist notified when on earth a newborn situation has been made. I get subscribed toward your rss nourish which be required to organize the trick! maintain a trivial day! This article achieved exatcly what I wanted it to achieve.